The attempt to clean up the spilled gas at Main Street and Fishkill Avenue continued today, with quite a few more truckloads of contaminated soil carted away in dump trucks throughout the day. And it may not be just the soil that has been compromised. According to several locals, there are subterranean feeder springs to the Fishkill Creek that traverse the area of the spill on the way to the creek. Hopefully this will not have spread too far and the damage will be to a relatively confined area. No word yet on the samples taken on the creek side of Main Street by the Department of Environmental Protection. Obviously, gas leaking into the ground is not a good thing by any measure. But the three gas stations within a half mile of each other on Main Street do other damage to our community. 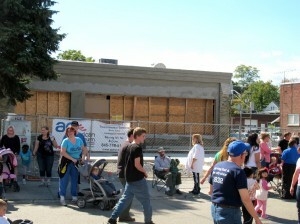 In terms of creating a walkable, pedestrian-friendly environment, which greatly affects both livability of a place as well as economic health, the curb cuts and building setbacks of the gas stations break the street “wall” and make walking past these zones both physically and psychologically unsafe. Note the pines on the left. They were cut down during the renovation. No more trees to get in the way of the view here. Most of us can conjure up an environmental degradation scenario brought about by gasoline entering the soil, especially so close to a water source. Even though we can’t see the gas in the dirt, it’s an immediate, observable event—we see DEP agents taking core samples, heavy trucks being filled and hauling away presumably contaminated soil, etc. Some of us might even get upset or angry over this egregious fouling of the environment. How could this happen!? Who is responsible?! Isn’t it odd, then, that we think little of how much contamination the same gas station doles out each day as a matter of its expected business. Consider that the average U.S. household consumes roughly 1,000 gallons of gasoline per year. Beacon has approximately 6,000 households, which would mean our residents burn through about 6 million gallons in 12 months. Each gallon of gas burned puts off about 19 pounds of CO2 into the air, for a total of 114,000,000 pounds of CO2. Xtrafuel is the busiest of the 5 gas stations within City limits, but let’s be generous and divide equally (I know Beaconites also buy gas out of town, but out of towners buy gas here, too. Don’t worry, for our purposes, it all comes out in the atmosphere.) This leaves us with a total of 22,800,000 pounds of CO2 emitted per year by the gas legally dispensed at Xtrafuel. We break out the hazmat suits and call in the heavy equipment when a few hundred gallons of gas drips into the soil, but spewing waste into the air and turning the joint into a giant crock pot while driving to work? Where’s the close-up on that? Note: Work stopped early yesterday when it was observed that the moisture content of the soil was too high, allowing contaminated material to exit the dump trucks as they drove to the disposal site. I’ve worked in environmental remediation and I will firmly tell you that you don’t have a clue what you are talking about. It’a petroleum spill first off, a gas leak usually refers to a vapor. 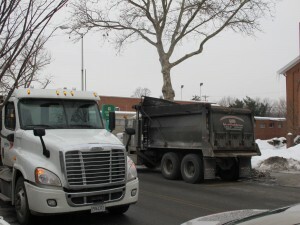 The DEC is usually responsible for oversight of these things seeing they have a spill department. Not the DEP. DEP is more along the lines of officers. And you aren’t going to bankrupt these owners, they own a lot of petrol sites. Also the DEP or the DEC wouldn’t be the ones taking samples. 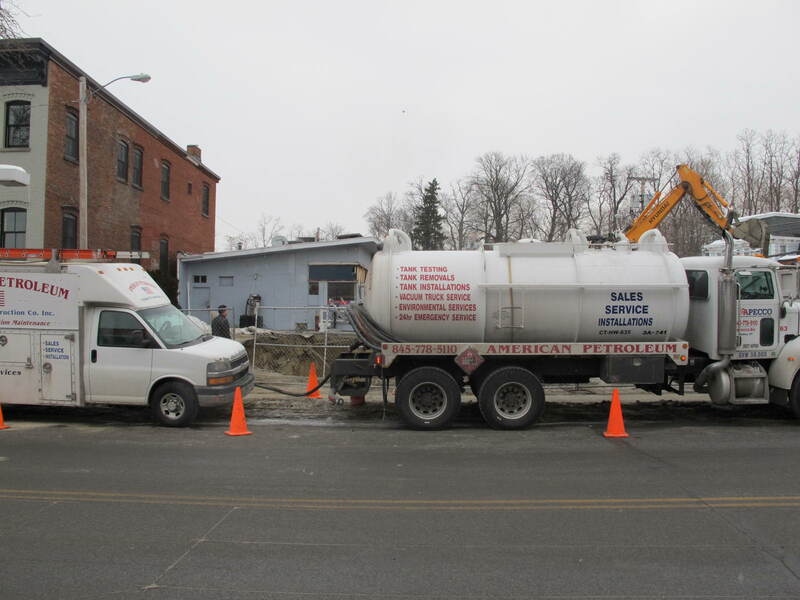 It’s usually trusted private remediation companies contracted by the state to do the sampling, soil extraction, and tank pulls. I know because it’s what I used to do. Please stop misinforming everyone on what little you know about how remediation works. Yes it isn’t a good thing that a spill happened, but they happen all the time everywhere. If they didn’t I wouldn’t have worked at that company for long. We have methods of cleaning this up that work. There are many laws in place to prevent and prohibit these accidents, and people are fined heavily for these mishaps to ensure that minimal responsibility comes from the public’s pocket. It’s a risk of being in the petrol business. I’m laughing because this is something that if you were observant you would have noticed a few months back like myself. If you want information on the subject I’d advise you to talk to the DEC and get a F.O.I.L. on the site, so you can understand the extent of the environmental damage with no need to speculate. This is bad journalism because it jumps to conclusions, shows that you lack an understanding in environmental studies, and lack of any sort of background education that would make you a credible source on these matters. I mean you called it a gas leak. It’s a petrol spill. 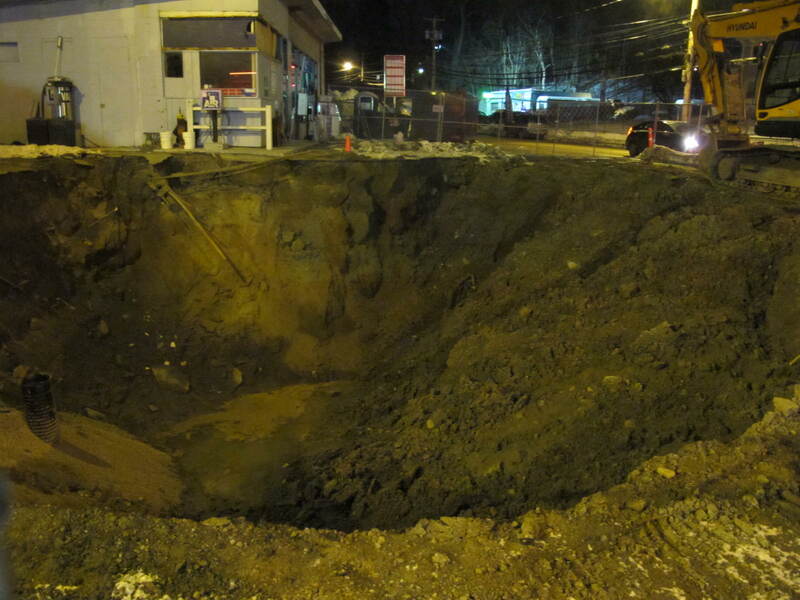 If you read the initial post, I called it a “fuel gas leak.” That’s because gasoline was found to be seeping out of a buried tank in the ground. Now it’s true propane is a fuel gas, but since I published pictures of the Xtrafuel gas station with the post, most of my readers got the point. As for it being a petrol spill, I only use the word petrol whilst I’m having tea and crumpets. You can get me all hot and bothered with your fancy jargon, but oil spills from a tanker. 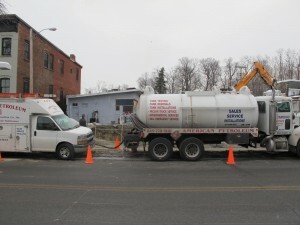 Gas(oline) leaks from an underground tank. Check it out, the EPA (that’s Environmental Protection Agency) even has an acronym for it: LUST, or Leaking Underground Storage Tanks. Now I am excited! It’s great to know that spills or leaks or whatever aren’t good things but no worries because they happen all the time everywhere. Whew! I got worried for a second. And now that I know trusted private remediation companies are taking care of things, I will sleep easy, especially since they finally put the fence around the giant open pit back up. I never said anybody was going bankrupt, it was an aside (although it certainly has happened). 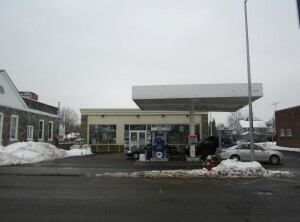 However, many gas stations are franchises: this one is owned by RCU Inc. of Wappingers Falls. All in all, you are making a way bigger deal of this than I did. 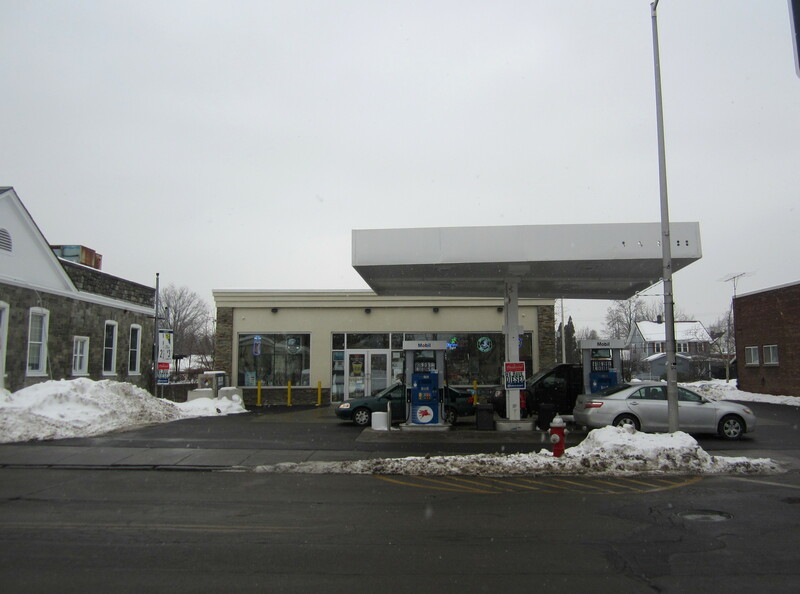 I was simply reporting that it was happening, hoped it would not be found to be extensive, and then used it to make other points, such as that, LUSTs or not, the three gas stations on Main Street are a blight on Beacon. Question for you, though. How do laws prevent and prohibit accidents? I confess, I’m laughing. Thanks for reporting this stuff, Mark. I know it’s a lot of work, and you do it because you care. No other reason. The gas station also know how much gas they sell and how much they buy and when the numbers don’t add up they know its leaking into the ground.So when do they have to report this ? Isn’t there laws on that? There should be, funny how you just don’t think about things like that until there is a problem! Just saying ! By my understanding, the leaking was from other, older, defunct tanks buried on site that were a surprise discovery when they began excavating. It’s quite possible that the tanks were more expensive to excavate at the time they were replaced than to just bury new ones on top and leave the gas in them. Not sure if that was or is legal, but it’s also fair to note that the most gas stations (or former gas stations) are the most common superfund sites, and if it was in fact old tanks that leaked, the owners would never know of the fuel loss. Ann, I think both Nicholas and Tom did a good job of answering your question. As I mentioned in the original post, the tanks that were leaking were not the ones the station was currently using. The contamination came from underground tanks that were no one knew where there. Before they dig they have to do an underground survey using GPR (Ground Penetrating Radar). However if the tanks are deep enough or there is concrete or something dense in the way there is no way of knowing what is under there. While no spills are good…this is far from a major spill and will be cleaned up with the DEC watching. We work on these types of projects regularly and finding things like this is not uncommon. They will clean it up and it will be better than before now that those old tanks are out of the ground. Tom, it’s good news to hear this is far from a major spill (though I guess it is all relative–compared to the Exxon Valdez it’s not; compared to spilling over while filling your chainsaw, yes). So what exactly is the extent of the contamination zone, then? 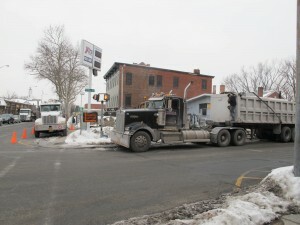 Does your statement mean that the core samples taken on the other side of Main were negative for contamination? It doesn’t mean that they were negative to contamination. They are trying to determine the extent of the contamination for ground water. You make great points. Well said. Is there something we can do as Beacon residents to help in these matters? Seems like an uphill battle with existing gas stations. Since we can’t avoid the car traffic, kind of, maybe we can encourage different car culture, like start installing electric car chargers in some of the municipal lots and on the street. Those lots aren’t very shady so we could even put up solar panel shade cover for parking spots.